Despite his success, college student and world-champion athlete Dan Millman is haunted by a feeling that something is missing from his life. Awakened one night by dark dreams, he wanders into an all-night gas station. There he meets and old man named Socrates, and his world is changed forever. Guided by this eccentric old warrior and drawn to an elusive young woman named Joy, Dan begins a spiritual odyssey into realms of light and shadow, romance and mystery. His journey ultimately leads him toward a final confrontation that will deliver or destroy him. 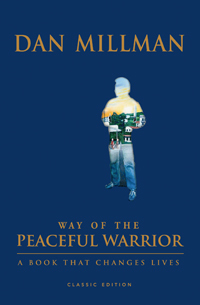 This classic tale, told with heart and humor, speaks to the peaceful warrior in each of us. Countless readers have been moved to laughter, tears, and moments of illumination as they rediscover life’s larger meaning and purpose. Journey with Dan on the peaceful warrior’s path to unreasonable happiness. Find out for yourself why this book changes lives.